As was to be expected Oldham Council have approved the building of seventeen homes for sale at Primrose Bank regardless of the knowledge that Devco pulled out of the scheme in 2013 after failing to sell any new homes built and Inspiral Developments Oldham never exercising their right to build houses for private sale at the site. In his usual rhetoric riddled self-praising style Councillor Dave Hibbert, Cabinet Member for Housing, Planning and Transport, said: “It has always been the council’s intention to build homes on this site. The finished properties would provide good quality family homes. The regeneration work that has already taken place at Primrose Bank, and other construction schemes, such as those at St Mary’s, Fitton Hill and Crossley, have transformed housing estates across Oldham.” As previously mentioned by Chronic-Oldham, and strangely enough not Councillor Hibbert, the four areas of Oldham that have the highest increase in housing benefit claims compared to 2011 are all PFI housing areas and Primrose Bank tops the list. 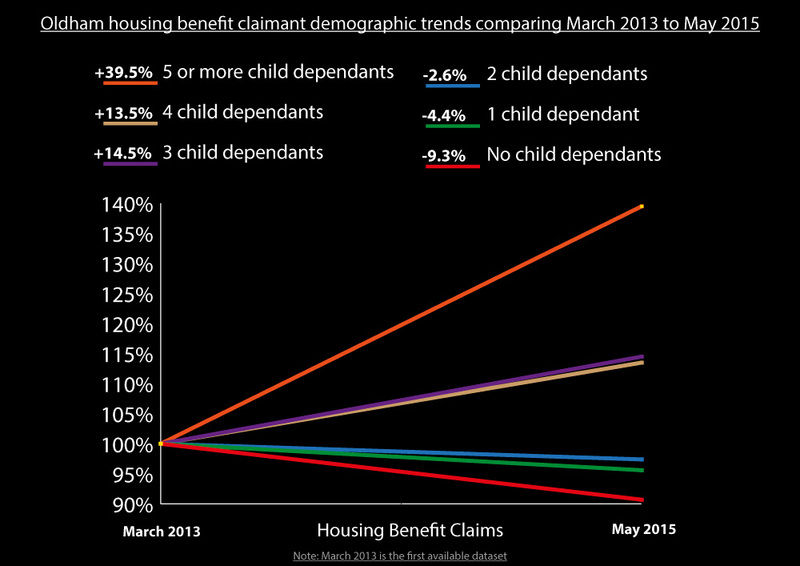 Oldham Council’s housing policy appears to be based on their flawed exponential population expansion model which increases revenue to the Council from Council Tax and expands the local economy via family spending but which also significantly expands the huge benefit bill and PFI & other long-term debt. 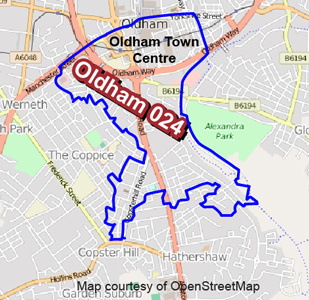 Oldham Council’s housing policy coupled with the Conservative’s disproportionate austerity targeting of non-family demographics has and continues to change the demographic nature of the Primrose Bank area, and to a lesser but still significant extent Oldham, these previous policy implementations now in turn drive any current interest in expanding housing further. 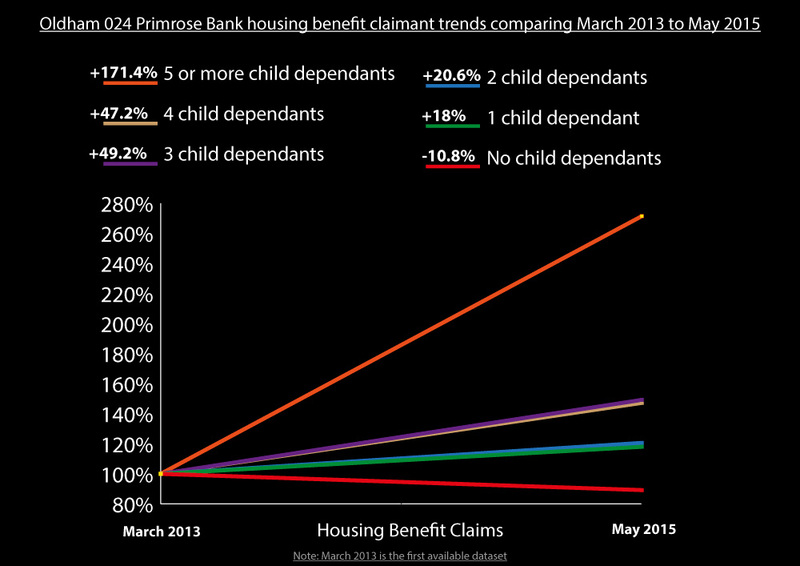 We have produced two graphs that show the demographic changes in housing benefit claims at both Primrose Bank and Oldham between March 2013 and May 2015 we have also included the latest national insurance data from the Department for Work and Pensions which is the best indicator for current immigration levels from the EU.